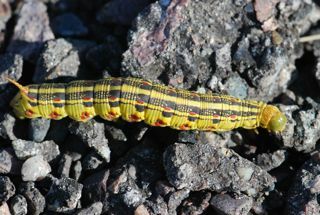 I was asked a question last week about what white-lined sphinx moth caterpillars eat. I had read that they eat wild relatives of the four-o'clock, a garden plant. 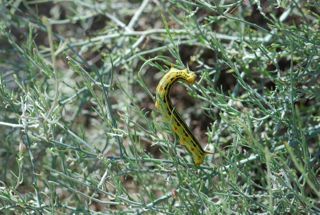 A few weeks ago we visited Boyce Thompson Arboretum State Park and I got some great first-hand information about what kind of plants the caterpillars feed on. 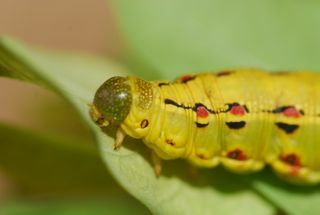 At the arboretum we found caterpillars on a native plant that is being used as a landscape perennial called pink guara (Guara lindeimeri). 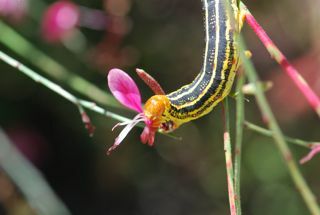 I noticed, however, the caterpillars were only eating the flowers. Often the flowers lack toxins or feeding deterrents found in the leaves or stems, although I don’t know for sure this is the case here. 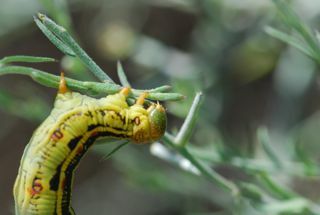 Some of the caterpillars were working on a plant called white ratany (Krameria grayi). I needed a friend’s help to identify that one. The plant has pretty purplish-pink flowers, but they are inconspicuous. 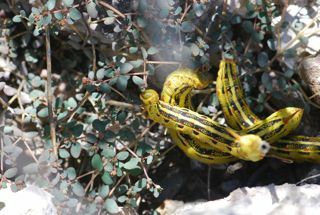 She said the plant is a partial parasite that takes food from the roots of fellow desert plants like bursage or creosote bush. I also found out that the flowers produce an oily substance rather than nectar (weird! 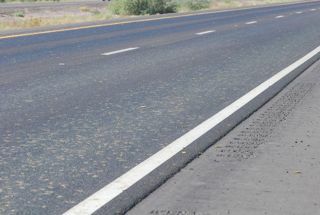 ), but that some native bees will take it to mix with pollen. 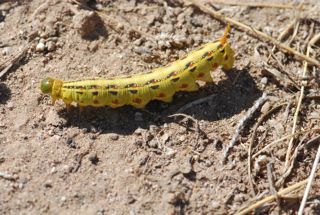 Finally, we cheered the caterpillars when we found this batch eating the noxious weed, spotted spurge. 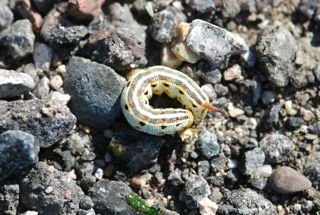 Go white-lined caterpillars, go! (Sorry, the photo isn't all that great).